As a Venerable and Athlete of the Lord. 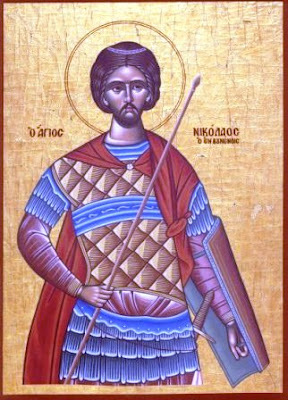 The Holy Venerable Martyr Nicholas was from the East, and was born to noble and godly parents. From the beginning the praiseworthy Nicholas turned away from conversing with youths of his own age, and loved to be around older and sensible people. When he was of a mature age, he entered the royal army, being very manly physically. In no time he did so many manly good things in battles, that he became known and famous to all. For this reason the emperor of the Romans during that time, hearing of the fame of the Saint, called for him and he went to the palace. Seeing that he was eloquent, and his works and actions were suitable, he made him duke of an eparchy, giving him soldiers to be subject to him. Because at that time the people of Thessaly apostatized from the emperor, and they did not want to pay the royal tax, for this reason the emperor sent the governor of the East together with this wondrous Nicholas, in order to battle against the apostates. Therefore Nicholas went together with his soldiers to Thessaloniki, the capital city of Thessaly, and they went to battle against and were victorious over the Thessalonians, and he made them give once again to the emperor the tax. He went to Larissa also, and battled there. Because the Romans were defeated in this battle, Nicholas saw that his life was in danger, so he withdrew from the battle, and he despised the world and all worldly things, going to the mountain of Vounenis. There he found some monks living in quietude, and he also became a monk and lived with those strugglers, in fasting, in prayer, in vigils, and all other hard work and asceticism. However, the devil who hates good, unable to behold the godly behavior of those monks, raised up the nation of the unbelieving Avars against the West. They traversed and ravaged many castles and lands, and arrived all the way in Larissa and the surrounding regions, such as Farsala, Elassona, Volos and Zagora. They humbled so much the Christians that lived in those places, they would force them to deny the Master Christ as true God, in order to worship idols. As this took place, the Saint prayed with his other fellow-ascetics, who were twelve in number, and an Angel of the Lord came by night, and told them to make preparation, for they would soon be martyred for Christ, and receive crowns of the contest. A few days later the Avars arrived at the skete, and the other Venerables, after they punished them with various tortures, finally they beheaded them. Seeing that Nicholas was physically fair, and sensible in soul, they began to try to persuade him with flatteries to renounce Christ and worship the senseless idols. Because the Saint remained firm in his piety, they flogged him so much that they had to change floggers two and three times. They then bound him to a tree and punched him. Then taking his spear, they pierced him. Seeing that it was impossible to turn the Saint away from his Christian faith, they beheaded him, thus the renowned one received the crown of the contest. His holy relic remained unburied on that mountain, guarded by divine Angels so that it was unharmed and incorrupt. Later the Saint appeared to be miraculous, healing the lepers, making the lame walk, and various others he healed of their illnesses, those who run to him with faith. As a physician without pay for the sick, and an irresistible helper in dangers, a fervent protector of the afflicted, and a champion of all those in need, O Venerable Martyr Nicholas from the east, intercede with Christ God, to save our souls. From the east today you appeared, as a luminous star, and in Greece of the west, you contested for Christ, we sing hymns to you Nicholas the New. Come let us praise O faithful, he who from the east shined as an athlete, guardian and deliverer of all Christians, Nicholas the New, the martyr of Christ.